I think your assessment that "It definitely feels like a book that would appeal to boys," is a tad sexist. Otherwise I think you're judging this book harshly, it was written at a 4th grade level. Thanks for your feedback. While I will say that of course not all boys have to like the same thing, there is a definite trend of narrative that would appeal to boys. This is mostly based on my experience and my own opinion while I was reading it. It goes along with what western society would consider "normal" for boys' gender roles, ie., Ronan protecting Greta as she is the "pure," which very strongly reminded me of the traditional "hero saving princess" which is a tale that is retold again and again in media and art forms that appeal to a large number of boys (video games as one example). Now, I wouldn't say every boy will love this book, but as this is a review I wanted to give an idea of the type of reader it would appeal to. I wouldn't suggest that someone buy The School of Good and Evil for 4th grade boys, as it is marketed towards girls and boys at that age tend to be more caught up in traditional gender roles, ie., not liking princesses or wanting to read about tea parties. I didn't mean to come across as sexist, but merely to state my own opinion while reading it. As for the 4th grade level, I would have to very much disagree. There is absolutely no reason why the age level you are writing for should affect the quality of story or writing. Some great classics have been written for children that are considered incredibly complex and beautiful--A Wrinkle in Time, The Outsiders, The Chrysalids, etc. Children can understand complex plots and appreciate detailed storytelling-- but they're also a hell of a lot less pretentious and picky than adults, and so are able to enjoy when something is just simply for fun. It's the lazy writer or pretentious reader that says writing for children means they don't have to work at it. 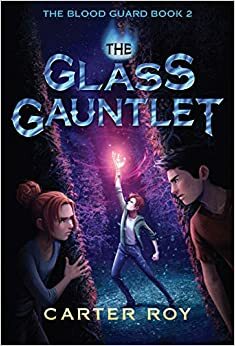 I enjoyed the Glass Gauntlet more than I thought I would, and I admitted where I had my own shortcomings, but there were still things I found that could be improved. Even the books I absolutely am head over heels in love with, there are ways to improve. It may be a harsh way of looking at things, but criticism is the only way to improve, after all.